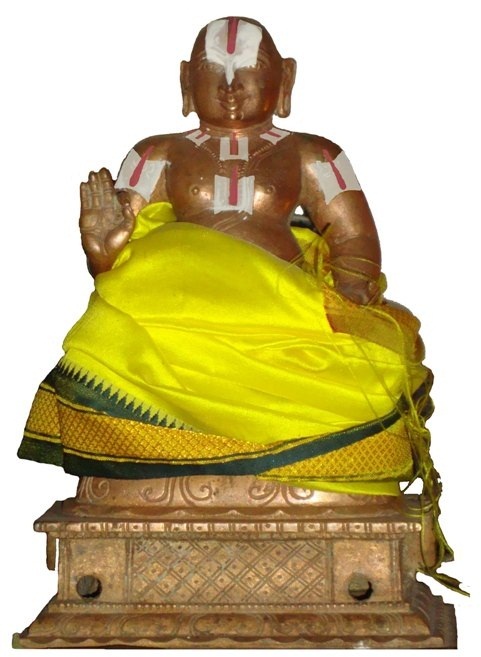 thiruvarangapperumAL arayar is the son of ALavandhAr and was one of the prime sishyas of ALavandhAr. arayar was expert in music, dance and drama. It was during his arayar sEvai infront of namperumAL during an adhyayana uthsavam, he was singing “kedumidar” padhigam of thiruvAimozhi (10.2). In that padhigam, looking at ALavandhAr who is the leader of the assembly, he sings “nadaminO namargaLuLLIr nAmumakku aRiya chonnOm” meaning “Oh! my dear devotees, go to thiruvananthapuram now”, ALavandhAr accepts that as the instruction from namperumAL himself and leaves to thiruvananthapuram to perform mangaLAsAsanam to anantha sayana perumAL. From the words of ALavandhAr during his final days, it is clear that arayar had great attachment towards thiruppANAzhwAr. During his final days, ALavandhAr declares that everyone should be very attached to thiruvarangapperumAL arayar because of his utmost devotion towards periya perumAL and thiruppANAzhwAr. Such is arayar’s greatness, that he is even glorified in public by ALavandhAr himself. arayar was instrumental in bringing rAmAnujar to srirangam. After ALavandhAr‘s time and after emperumAnAr accepting sannyAsAsramam, all the srivaishnavas in srirangam pray to namperumAL to bring rAmAnujar to srirangam for living there permanently. periya perumAL at once sends a request to dhEva perumAL to send rAmAnujar to srIrangam. But pEraruLALan says he cannot send rAmAnjuar who is very dear to his heart. periya perumAL then devises a special plan to bring emperumAnAr over to srIrangam. He tells arayar that pEraruLALan likes music and sthOthram very much and once he is pleased he will give anything to the ones who pleased him with sthOthram. So, he instructs arayar to ask for emperumAnAr when dhEva perumAL wishes him to give anything. arayar then leaves to kAnchIpuram, and when he reaches there, he is welcomed by varam tharum perumAL arayar (who is the local arayar swamy) to his thirumALigai and is looked after nicely. The next day, thirukkachi nambi hears about arayar’s arrival and he goes and offers his praNAmams and enquires about his well being. arayar requests nambi to bring him to dhEva perumAL for mangaLAsAsanam (it is customary for srivaishnavas while going to dhivyadhEsams, to always go to emperumAn with/through local kainkaryaparars). nambi obliges and arayar when seeing dhEva perumAL offers his obeisances reciting “kadhA punas chanka rathAng kalpaka dhvaja aravindha angucha vajra lAnchanam; thrivikrama thvachcharaNAmbhuja dhvayam madhIya mUrdhdhAnam alankarishyathi” meaning “Oh thrivikrama! when Oh when your lotus feet which has many auspicious symbols like the conch, sudharshana chakram, kalpaka tree, lotus, etcis going to decorate my head”. emperumAn through his archakars presents him thIrtham, prasAdham, srIsatagOpam, etc to him and asks him to render arayar sEvai in front of him. arayar with great love and devotion sings from many AzhwAr’s srIsUkthis with dance and action. emperumAn becomes extremely pleased and offers him many gifts. arayar says that he does not need those gifts and tells him that because dhEva perumAL is the one who bestows the desirers with whatever they desire for, emperumAn should also fulfill his desires. emperumAn agrees and says “I will give anything but myself and my wifes; go ahead and ask”. arayar then shows rAmAnujar and says that he wants him to be brought along to srIrangam. dhEva perumAL says “I did not think you were going to ask for him; ask for something else”. arayar replies “you are none other than srI rAman who does not have two words – you cannot refuse any more”. dhEva perumAL then finally agrees and gives a farewell to rAmAnujar. arayar holding rAmAnujar’s hands and starts his journey towards srIrangam. 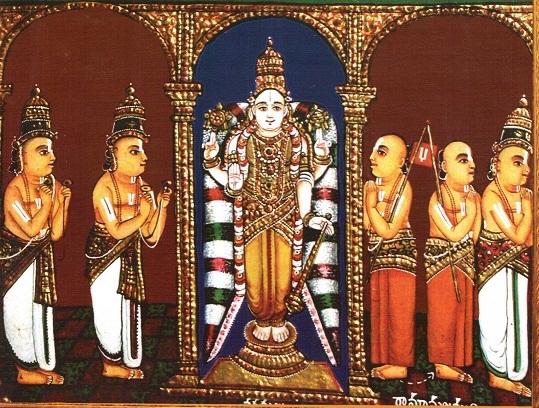 rAmAnujar then asks AzhwAn and ANdAn to go to his mutt and bring his thiruvArAdhana perumAL (pEraruLALan) and all the paraphernelia and leaves to srIrangam with everyone after taking permission from dhEva perumAL. Thus, arayar did the most important favour for srIvaishnavam by bringing rAmAnujar over to srIrangam to establish our sampradhAyam firmly and take it to great heights. ALavandhAr instructs his 5 main sishyas to teach 5 different aspects to udayavar. periya nambi performs pancha samskAram to udayavar. 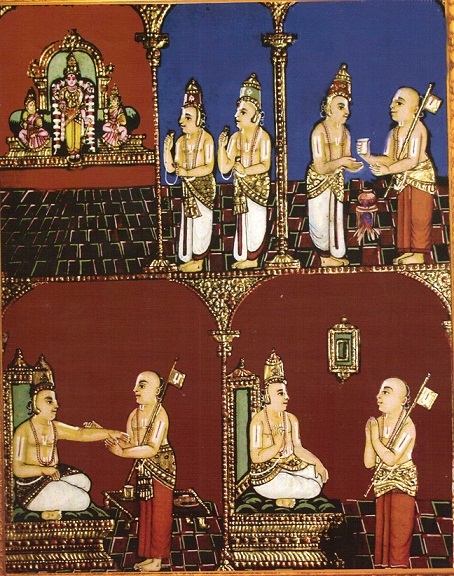 periya thirumalai nambi teaches srI rAmAyaNam. thirukkOshtiyUr nambi teaches thirumanthra and charama slOka meanings. thirumAlai ANdAn teaches thiruvAimozhi. thiruvarangapperumAL arayar was instructed by ALavandhAr to teach some parts of aruLicheyal and charamOpAyam (the ultimate means – AchArya nishtai) to udayavar. emperumAnAr learns thiruvAimozhi fully from thirumAlai ANdAn and then periya nambi instructs him to learn the essence of our sampradhAyam from arayar. emperumAnAr, following the principles identified in sAsthram, first performs kainkaryam to arayar for 6 months before asking him to teach anything. He prepares milk in proper warmth every day and also prepares turmeric paste for arayar to be applied on him when necessary. Once emperumAnAr prepares the turmeric paste that was not satisfactory for arayar – udayavar finds that out just by looking at arayar’s face which shows dissatisfaction. udayavar then prepares another batch of turmeric paste which satisfies arayar’s heart so much that he instructs the ultimate means and ultimate goal – AchArya kainkaryam. He instructs that “we should always think that the emperumAn who is lying down in kshIrAbdhi (milk ocean) is the one who has taken the form of AchAryan”. We have already seen charamOpAyam in detail in ponnadi.blogspot.in/p/charamopaya-nirnayam.html. In eedu vyAkyAnam for 1.5.11, while explaining “pAlEy thamizhar ichaikArar” (பாலேய் தமிழர் இசைகாரர்) where ichaikArar means expert musician, nampiLLai quotes AzhwAn who would say ichaikArar means thiruvarangapperumAL arayar. In eedu vyAkyAnam for 3.3.1, nampiLLai explains that when arayar starts singing “ozhivil kAlamellAm” (ஒழிவில் காலமெல்லாம்), he becomes very emotional and keeps singing kAlamellAm, kAlamellAm and completes with that without proceeding. In this padhigam, AzhwAr requests for eternal/uninterrupted/pure kainkaryam for thiruvEnkatamudayAn and this padhigam is identified as the explanation for second line of dhvaya mahAmanthram (kainkarya prArthanai). Let us pray at his lotus feet to bless us with the same attachment towards emperumAn and AchAryan as well. I glorify thiruvarangapperumAL arayar who stayed like a beetle in the lotus feet of maNakkAl nambi, who is the divine son of yAmunAchAryar, who is filled with auspicious qualities, who was born by the divine grace of srI ranganAthan and who had srI bhAshyakArar as his sishya. This entry was posted in other AchAryas and tagged arayar ramanuja on January 12, 2013 by sarathyt. adiyEn Swami. I think the last 2 lines of the thaniyan need to be included here and in the thaniyan page also. thanks for pointing it out – fixed now. Are Sottai Nambi and Tiruvaranga Perumal Arayar one and the same acharya, the son of great Alavandar? And also please give adiyen, thirunakshatra thaniyan of swamy Arayar. Because adiyen came across vazhi tirunamams of Arayar swami, but the thirunakshatra thainyans not in the name of Arayar, but in the name Sottainambi. ALavandhAr had 4 sons. sottai nambi and thiruvarangap perumAL araiyar are two of them. Other two are dheyvaththukkarasu nambi and piLLai arasu nambi. adiyen don’t have the thirunakshathra thaniyan of araiyar – will try to search for them. Ok Swamy. There are thirunakshatra taniyans for all the Acharyas of Swami Ramanuja, but Tiruvaranga Perumal Arayar Swami, for some reason. It would be great, if we could get one him as well.